This award gives the public the opportunity to vote for its favorite house, and solar decathletes from The University of North Carolina at Charlotte accepted the award at a private Victory Reception at Hangar 244 in the Orange County Great Park—the last official event of Solar Decathlon 2013. Designed as an urban infill project, UrbanEden has a variety of sustainability features, such as thermal mass, passive solar, and radiant energy as well as unique technologies that demonstrated true innovation, including radiant geopolymer concrete walls, movable photovoltaic shading, and a nighttime radiation emitter. These technologies helped the team win a third-place award in the Engineering Contest. But what wins the People’s Choice Award is capturing the hearts of visitors. 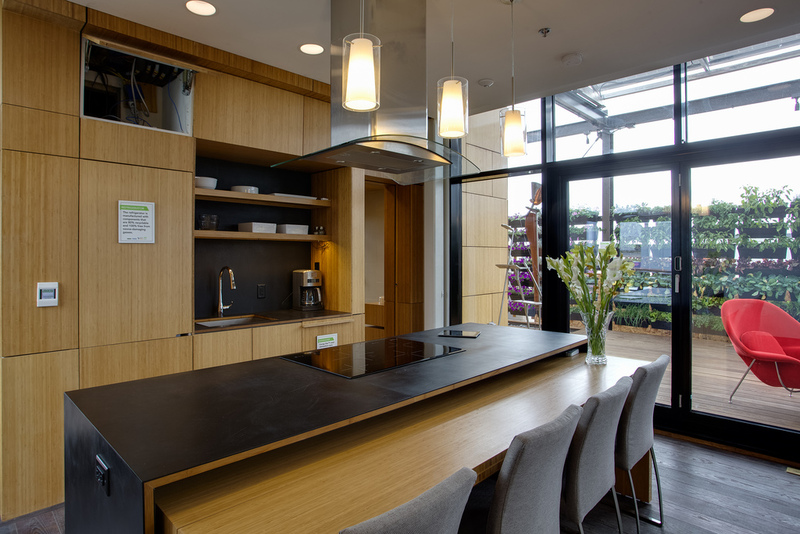 And their house is beautiful, with its light-filled rooms that open to a garden-rimmed outdoor deck, laminated bamboo cabinetry and paneling, and continuous ash flooring. UrbanEden is a house people can imagine themselves living in. A house that could easily become a home. See a virtual tour of UrbanEden and learn more about the house and The University of North Carolina at Charlotte team. This entry was posted on Sunday, October 13th, 2013 at 12:15 am and is filed under Awards, North Carolina, Solar Decathlon, Solar Decathlon 2013.